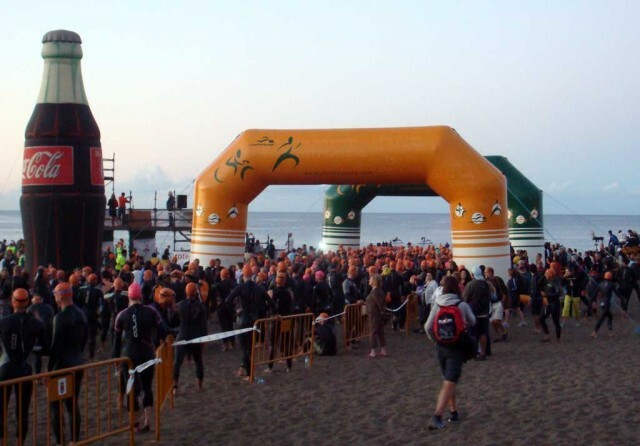 Ironman Lanzarote is just five days away. By this time Saturday many athletes will be finished and started on their celebrations. I’ll have spent my day spectating; standing by the ocean or the side of the road, cheering them on. I may squeeze an easy run in during the morning whilst they’re out on the bike, but otherwise my day involves far less exercise. This is an entirely new perspective on the Ironman for me. I’m really looking forward to seeing the race from the other side. I’ve raced Lanzarote twice, but this year I’m here as a coach with two athletes in the running. Both are experienced, though one is new to Ironman; both have strong potential to performance well; both are grumbling about the lack of training during their taper, a good sign they’re ready to go. It’s going to be exciting seeing the results of the last few months of work. Weeks of training on the island mean I’m familiar with the course. Having been here for a week I’ve checked out some of this year’s alterations and know what my athletes can expect. I’ve never had the race I wanted here, something I intend to rectify in the future, but based on my experience I know what should make for a good race. There’s only a few days left so hopefully if you’re racing you have your plans in place. 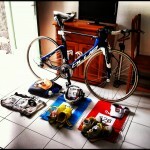 This is my approach to Ironman Lanzarote. Lanzarote’s swim is simple – two laps with a beach run between them, a long string of buoys to follow and a crowd of athletes to survive. The start is the toughest part; athletes are queued on the beach no more than thirty wide, when the gun goes there’s a rush into the ocean. For four hundred metres to the first buoy it’s manic as everyone puts a sprint effort in. Survive this and the swim soon calms, whilst it’s not the fastest course it’s an easy one. For a nervous or slower swimmer the safest starting point is further back and to the right of the group. This gives more options to escape the crush early and swim in clear water. If you brave the bunch you’ll get pulled along much faster initially and can potentially draft a faster group. Stronger swimmers should position themselves near the front and be prepared to play rough. Get your spot on the start line early as it soon gets crowded, leave it too late and reaching the front is hard work. Beyond that first turn a line of buoys on the left marks the route to the far point; you will not have to sight. Find good feet and follow the group. This is where braving the start pays off, you can get towed to the far turn. The return leg requires a little more skill – you will need to sight. The Fariones hotel is the largest landmark to watch for so aim at that, but keep check on your line. There’s a short run before the second lap, worth practicing to ensure your goggles stay in place on entry. The first transition is on the beach and does involve sand. The run from the tent to the bike is long so if you don’t keep your shoes on the bike carry them there before putting them on. As with any transition my preference is to keep things simple. Decide what you’ll use before race day and only put that in your bag – don’t give yourselves extra choices under race pressure. Lanzarote is famous for its bike. Hot, windy and hilly – it is challenging. Pacing is critical to any Ironman, but if anything it’s easier to make an early mistake on this course. After winding through Puerto del Carmen the road soon turns up as it heads out towards Yaiza. Already athletes start pushing, any notion of a cap on intensity seems lost, it’s all about gaining places. Ride smart, let them go by and keep within an intensity cap. The pace will pick up on the highway to El Golfo. The road is smooth and there’s typically a tailwind, expect to go fast for little effort. El Golfo itself provides plenty of short rises into a headwind, once again keep control. An Ironman is not the place to regularly spike power; it’s easy to build fatigue with surges over small bumps in the road. Timanfaya is the first true climb. Not steep, but usually into a headwind. Again the most common mistake is to push too hard at this stage; control intensity. The riding from the top of Fire Mountain through to La Santa is much easier with long descents. Keep focussed and avoid easing off too much during this section, it’s an opportunity to recover not to ease up. The race continues through Soo and Famara and up a gradual, wind assisted climb to Teguise. Beyond Teguise the next major climb starts – the ascent of Haria. Most notable for the final section of steeper road as you pass the wind farm. A tough moment before the top of the climb and special needs station. Over the summit and there’s a fast descent with a few switchbacks leading towards the north of the island and Mirador del Rio. There are a couple of climbs on the way, but mostly it’s rolling and the views on the final climb distract from the gradient. Mirador del Rio is the point to raise your effort. The descent is fast, but avoid going easy. A typical northerly wind will carry that speed onto the highway, a fifteen kilometre time trial before the final climb. The course has been changed back to the older route taking the rough Nazaret road rather than climbing back to Teguise. What is saved in climbing is lost in comfort; Nazaret’s road is the worst of the entire ride, the second half barely qualifies as paved. Back on the middle of the island and the rest is easy. A well paced race will leave enough energy to push and reclaim places lost earlier in the race. There’s a notable slowing in the field after Mirador del Rio if you can maintain your effort you will gain. Whilst there are a few short ascents, the section back into town is all downhill. It’s worth learning the final track as it can be easily taken without needing to brake – a good opportunity to recover before the run. It’s a long way from the dismount line to the change tent; leaving shoes on the bike makes it much easier and faster. I take my time in the tent to ensure I get a coating of suntan lotion and have cooled down a little. The run is hot and exposed so a minute lost for comfort in transition can easily be made up. The current course consists of one long loop followed by two shorter ones. It’s not scenic, but mercifully flat following the tough bike. There are no significant undulations to worry about, maybe one or two longer rises near the finish line. The wind and heat are the main challenges; good pacing and nutrition are needed to stay on top of this. I emphasise cooling through aid stations. Take on food, but look for ice and cold fluids to bring your temperature down. Pouring ice down my shorts has proven a very effective strategy in hot races. My standard Ironman run strategy will work here. Start off easy and hold for a few kilometres before building into Ironman pace. Hole this for the bulk of the run, it’s only the final lap where I consider pushing. If I’m feeling good I’ll attempt to lift the pace for the whole lap; at the least I look to go hard for the wind assisted return leg. In the conditions raising my effort may not equate to going faster, but if I’m slowing less than others then my strategy is working. One final piece of advice. Once over the finish line, collect the medal, walk through the medical tent and find the ice cream! After a long, hot day it’s needed.